The Mitsubishi Lancer 2.0 GT was launched yesterday, and I managed to attend the public launch thanks to an invite from EON Automart Sdn Bhd – thank you Ellis! 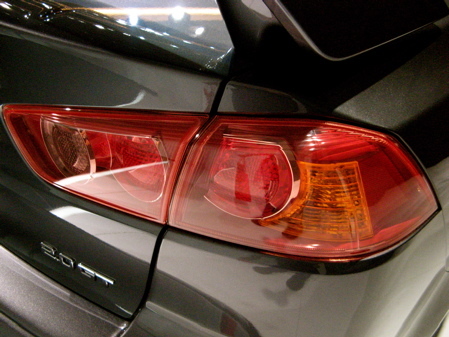 This latest entrant into the coveted C-segment market is a fully imported CBU unit from Japan. Now you might expect it to be abit pricey because of this – just look at the price of the other C-segment CBU Japan car – the Mazda 3. Rumours of a sub-120K ringgit price seemed to indicate a CBU from another ASEAN country. But Mitsubishi Motors Malaysia truly surprised us all with an aggressively lower price of RM 115,980 OTR with insurance for a CBU Japan car! 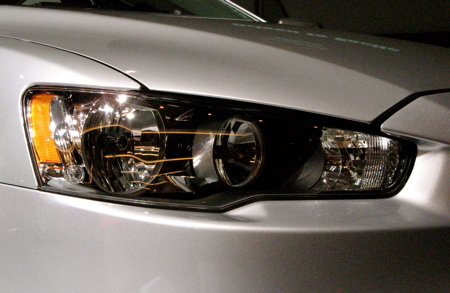 Anyway, let’s get down to what the Lancer offers other than a competitive price. The new Lancer is bigger than the previous model, which might give us a clue on why Mitsubishi decided to call it the Galant Fortis in Japan instead of the Lancer – Japan normally classifies cars according to dimensions. 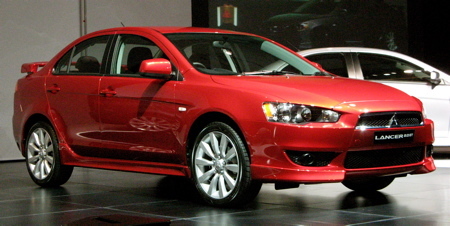 The 2007 Mitsubishi Lancer is only available in one trim level for Malaysia – the Lancer 2.0 GT. 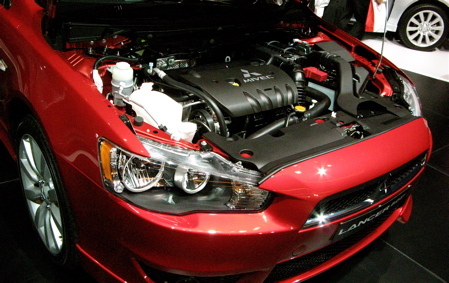 The Lancer 2.0 GT packs 155PS at 6,000rpm and 199Nm of torque at 4,250rpm under it’s hood. I will not go into further details on the engine here, please read my previous detailed post on the 4B11 engine for more details. It’s a must read for those who are slightly more geek-inclined. The Lancer 2.0 GT is only available with the INVECS-III CVT transmission in Malaysia, so stick shift fans will be slightly disappointed. However, it makes up for it somewhat with 6 virtual gears that you can cycle through with the steering-mounted magnesium paddle shifters. 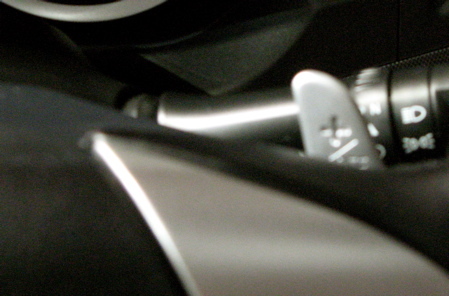 Suspension consists of a MacPherson strut setup at the front and a multi-link setup at the rear. The feature list is impressive. You have a full sporty bodykit complete with a rear wing that’s not too large in my opinion, and you’ve got huge 18 inch alloy wheels. One thing I noticed is that despite 18 inch wheels, fender gap is still very noticeable, so for the best aesthetics most will be looking to lowering the car. On the interior, you have a 6-disc in-dash CD changer with a 6-speaker audio system, steering wheel audio controls, and fully automatic single zone air conditioning. No cruise control though. The interior is done up in a nice dark grey colour with geometric check trim panels – I suspect some enterprising people will be developing carbon fiber replacement panels for these soon – could possibly look really nice. 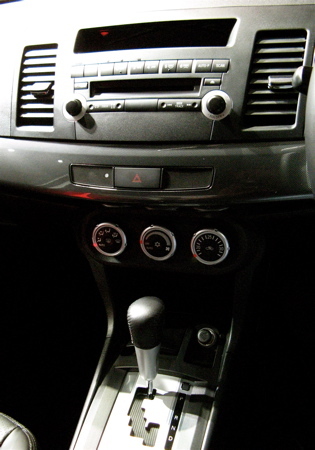 Unlike the LCD and push-button interface for automatic air conditioning that most cars have, the Lancer’s dash design looks like your conventional three-knob manual air conditioning control at first glance – but it is in fact automatic. Operation of the auto air conditioning looked intuitive to me, simply push one of the knobs to activate automatic climate control for the set temperature. The meter panel consists of two large meters (speedo and RPM) flanking a small multi-information display LCD that lights up with red lettering. 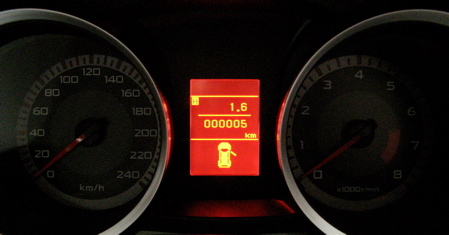 The multi-information display can show a few screens with information such as average speed and fuel consumption, engine coolant temperature and odometer, distance until empty and odometer, as well as a maintenance schedule record. 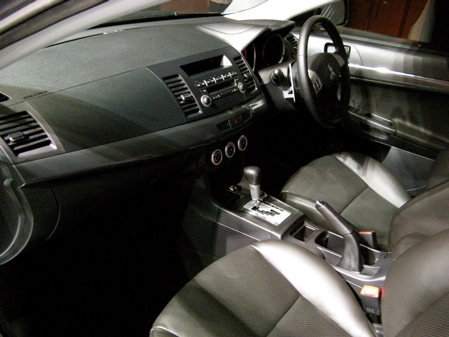 The Mitsubishi Lancer 2.0 GT comes with sporty leather seats – the leather used is Nappa leather which is a premium leather, none of that PVC fake leather stuff. According to Wikipedia, Nappa leather is a full-grain leather, typically dyed, made from unsplit kid-, lamb- or sheep-skin, and noted for softness and durability. It is often used in high-quality leather products such as high-end furniture and accessories such as wallets and luggage. 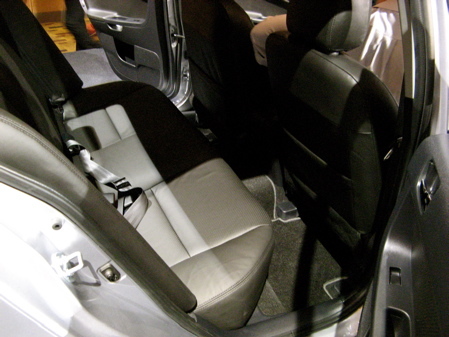 The front seat is height adjustable, while the rear bench has an arm rest with two cupholders built into it, and the whole bench can be folded down in a 60:40 split in case you require more storage capacity. 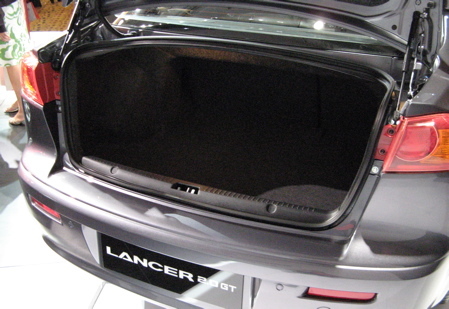 The Lancer 2.0 GT’s front seats have sensors built into them – these work hand in hand with the SRS airbag system, feeding the airbag deployment logic data on the driver’s seat position and the front passenger’s weight. 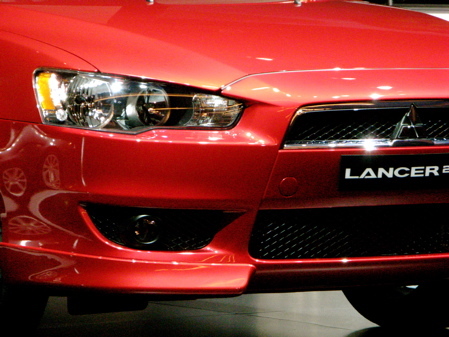 Other than the two front SRS airbags, the Lancer 2.0 GT also has anti-lock brakes and electronic brakeforce distribution, however there is no form of electronic stability control. 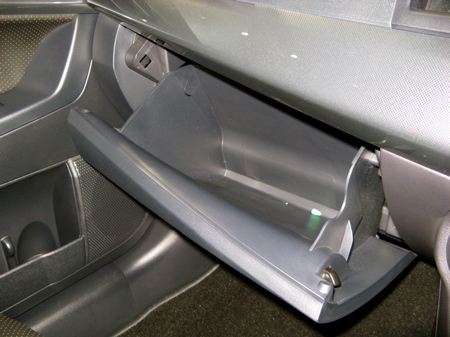 The rear boot has 400 litres of storage capacity, and while I could not find any handle to open the boot from the rear, there is a boot lid release button on the remote control that you can press if you need access to the boot without having to pull the boot release lever from inside the car. 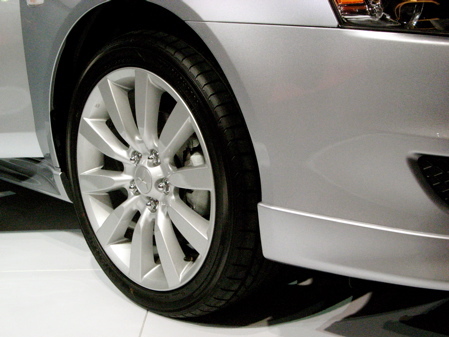 The Mitsubishi Lancer 2.0 GT is only available in four colours – Cool Silver Metallic, Medium Purplish Gray Mica, Red Metallic, and Black Mira. 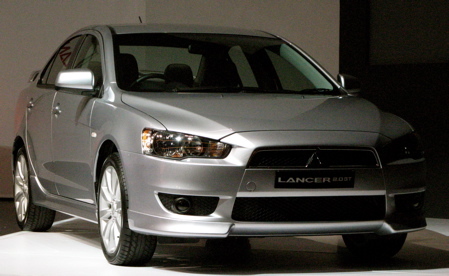 The Lancer comes with a 5-year or 100,000km warranty, with free maintenance for the first 3 years or 50,000km. Have a look at two videos after the jump, as well as more photos of the Lancer.